In Part One of this series, we discussed racial diversity in the composition of the membership. In Part Two, we addressed diversity in the leadership (including ministry staff). In this third segment, we will cover some important aspects of diversity in the membership from the standpoint of our worship service approach, as well as what takes place outside the building in personal interracial relationships generally. Actually, we will broaden the term “worship service” to include our gatherings more generally, including social fellowship before and after services. Let’s begin with a few observations about that social fellowship when we gather for services. We all know the common saying that birds of a feather flock together. We humans (strange birds and odd ducks!) are by nature quite the same in that we are more comfortable with those like ourselves. We usually choose as friends those near the same age with similar backgrounds and interests. Certainly this approach is not only understandable; it has many positive features to commend it. That being said, if it leads to any form of cliquishness or division, it is negative ─ period. A few months back, we had a family visiting our church group as a result of my wife having invited the woman of the family while both were eating in a fast food restaurant. Theresa went around to teens and adults, asking them to fellowship with this family after services were over. She was shocked at how few actually came over to meet them (and thankful for the few who did). The family was a very normal family with absolutely nothing about them that would be seen as unattractive to others. Quite the contrary, in fact. In the old days, they would have been swarmed by members wanting to meet them and ask them to study the Bible (when the visitors usually didn’t even know what that meant and why they were being asked). Now after the last song is sung or the last prayer is prayed (our traditional ways of ending the service), we all too often just start talking to those in our closest circle of friends. Need I say that our closest circle is usually of our own race or ethnicity? I honestly don’t think in this case that the issue is one of prejudice, but rather one of comfortability, thoughtlessness and just plain selfishness. The first people we should talk to are the ones we don’t know or hardly know. This approach insures that visitors are met and new members are welcomed. It also blurs the lines of other distinctions and thereby suggests that we really are a family – a diverse family. I was sharing this with a group in another city, and afterwards, a sister shared with me that whether our meeting place has chairs or pews, many members have their “seat” or “pew” reserved (at least in their minds). In other words, they sit with the same people every week (and we are not speaking of a youth group who has been asked to sit in the same section) and fellowship with the same people every week. The sister said that she sometimes decided to sit on opposite side of the auditorium from her usual place and received texts or calls later asking if she were okay, since she had “missed” church (according to their mistaken assumptions)! It makes me wonder how many of our newer members and more bashful members feel awkward and hurt by such actions. If they are a part of a racial minority in the church, would we wonder why they might suspect prejudice as the cause? It hurts me to even think about this possibility (probability?). Are we drawn to folks like ourselves? Normally, yes. (I use the word “normally” here because I am more drawn to non-whites in the fellowship.) But what comes naturally doesn’t mean it’s right. I think back to a time years ago in a certain ministry setting when I really didn’t enjoy our all-too-predictable midweek services. My worldly nature begged me to figure out an excuse to skip. Thankfully, my spiritual nature begged me to deny self and follow Jesus. I came up with a solution for my perceived problem. I decided that whether I “got” anything out of the assembly or not, the real issue was what I gave. So, I thought of a plan to find three people who looked lonely or like they were hurting and have a meaningful talk with them during the fellowship periods before and after services. That simple (and spiritual) decision changed everything, especially me. I was amazed at how God led me to talk to people who needed some loving, and how good I felt after providing it. When Jesus said that it was more blessed to give than receive (Acts 20:35), he was spot on. Interestingly, this saying of Jesus is not found in the Gospel accounts, but for Paul it was worth remembering and I’m grateful that he recorded it for us selfish humans! Please, let’s have diverse fellowship and not allow comfortability and selfishness to lead us into segregated fellowship (of any type, racial or otherwise). What are your services like? Do they “fit” the makeup of your ministry group or church? Do your members like them? How do you know? In one sense, every person present will have their own opinion about what they like or don’t particularly enjoy, regardless of race or ethnicity. I’m pretty flexible for an old guy, or at least I think so. Maybe that’s why I like variety so much and get bored easily. I tire quickly of service styles that are easily predictable. Others get disturbed when too much variety comes along. As I say, we all have our opinions and preferences. Other options in services, the way that we “do” church, do relate more closely to culture. I majored in music in college, and tended to enjoy all types of music. I taught in the public school system as a band director, but played professionally as well. I played in a symphony and loved classical music. I also played in dance bands, Dixieland groups, jazz groups, and summer “pops” band concerts in a local college amphitheater. I loved it all, the varied settings and the varied music. In church, I’m much the same way. Church music in most of our groups fall into three broad categories: traditional hymns, contemporary popular style (Michael W. Smith and Chris Tomlin being examples of this style) and gospel choir. Solos or small group special songs vary quite a bit as well, with the African American style having more “soul” in it. 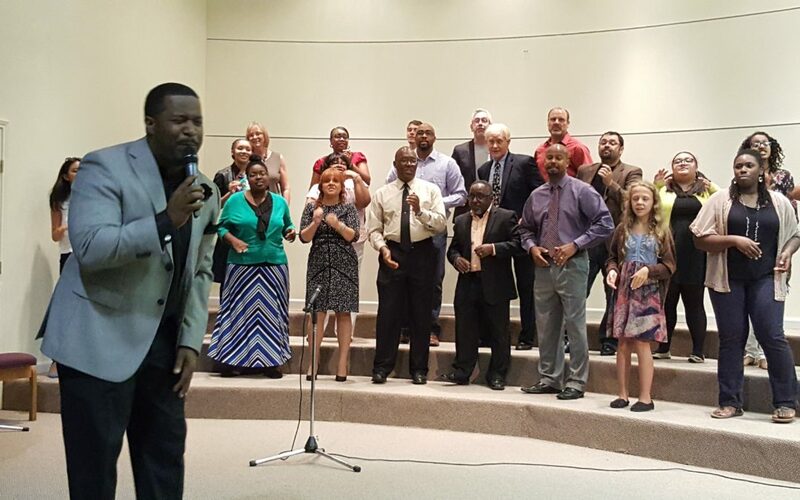 The latter, plus the gospel choir type, are characteristic of many predominately black churches. We have all of these styles in our local church, and I’m good with all of them, although I favor the contemporary style personally. In one of my earlier drafts of this article, I made the following statement about my own preference in reference to music provided during the communion service. “Perhaps my one pet peeve is having one of the more ‘soul’ type solos sung during communion. They typically invite audible responses from the audience (comments and cheers) that detract from contemplating what communion should be all about, thus taking the emphasis off of Jesus and placing it on a performance.” If you are inclined to say “Amen!” to that, don’t do it. Keep reading. Thank God for Honest Input! In reviewing this article, one of my main advisers, Michael Burns, had this to say: “Does communion have to be contemplative and quiet or is that a cultural preference? The picture I get of first century communion meals was that they were a bit more family-focused and celebratory, like Passover meals.” Wow! What a great reminder! I have often thought that communion was too focused on the death of Christ rather than his resurrection. A focus on the resurrection makes communion a victory celebration rather than something akin to a funeral service. My appreciation for input and dialogue was increased my Michael’s willingness to give me another way to think about the music styles used during communion. By the way, you are going to continue to see Michael Burn’s name in this blog, because I cannot say enough about his new book, Crossing the Line: Culture, Race and Kingdom. It is a spectacular book and a must read for everyone in our movement of churches, my primary target audience. Some people so strongly favor one style over another that they develop other pet peeves regarding the type music we have in our services. All of us, including moi, need to guard against such reactions. God has a sense of humor, a fact that he has often shown me. After thinking about Michael’s observations regarding what I had written, guess what happened at our Easter service this past Sunday? A young sister of color (Black and Asian) sang one of those “soul” songs during communion that I had just written about. She’s a great singer, whom I have known since she was a teen, and is like a daughter to me. As she sang, I couldn’t help but chuckle at the timing and of God’s little surprises to help me get the point! I think God and I both enjoy these little experiences, and that we both laugh. I would like to see our worship leaders (and leaders in general) find out what the majority of the membership in any given group enjoys most. Of course, it is not just a matter of enjoying, but having our hearts and minds ministered to spiritually. Although, as I’ve already said, opinions vary, but what is the majority preference? That’s not a difficult thing to determine, if we provide a forum for the expression of those preferences. It shouldn’t be a matter of “white church” music or “black church” music, but a matter of what ministers most to the majority of our members. Even then, variety should be a part of the mix since we have a variety of tastes within the membership. We could do the same thing with the preaching, in providing a way for members to give input about what helps them most spiritually. As a preacher, I have the responsibility of knowing the flock as well as possible and meeting the needs that I see. Of course, we have perceived needs and needs of which we are unaware (one good reason to have more expository preaching straight from the biblical text). Our hearers have different needs for different reasons. Some may be lukewarm and want to have their ears tickled. Some may be really hurting spiritually or emotionally and need to hear some lessons that are strong on comfort and encouragement. In this case, both types want the same type of content, one for good reasons and one for dangerous reasons. Some love really strong preaching, the type that we hear less and less of because too many of our preachers seem to be trying to imitate popular megachurch preachers (my opinion, of course). I understand that this is a complicated subject in some ways, but those of us who speak regularly could benefit just from determining what the members think helps them most to grow. They are Listening ─ Are You Listening? My opinion is that more of our members feel about the same than most leaders realize. That opinion may be colored by my own preaching style, but the response to it is a part of how my opinion and preaching style developed in the first place. Life has plenty of challenges, death and Judgment are real, and I am not hesitant to share biblical truths in a straightforward and strong way. But my point here is that we need to hear the input of our members. It won’t determine what and how we preach, but it should influence both. I do see differences in how Blacks, Whites, Asians and Hispanics as a whole respond to preaching. But my assumptions here could be wrong or at least partly wrong. Hence the need for input. Insecurity: a Block to Input! Some insecure speakers are afraid of trying to ascertain what members really think about our services, and about their speaking specifically. I have talked to some leaders who have the idea that if you ask for the opinions of others, they will at that point develop opinions and that they are likely to be negative. This is one of the most laughable mistaken assumptions possible. We all have our opinions, whether we are asked to share them or not. I would rather know what they are than wonder about it. Constructive criticism is a friend to us all, an aspect of this thing we used to call “discipling.” Will some be destructively critical? Perhaps, but only a very few. I listen to lessons almost exclusively in a non-critical matter, just trying to let God use the speaker to communicate what I most need to hear. Occasionally, if something is obviously in need of change, I will talk with the speaker about it, but for the most part, I just want to know what I need to change. I trust that the large majority of our members feel much the same as I do. They are not negatively critical, and if asked for input, it would be of the constructive type. Our services overall typically consist of fellowship before and after the “official” part of the service; the music; the preaching; other short presentations for communion and giving; and finally, the announcements. How we do all of that will vary, but it should take into account the composition of the audience, as well as preferences (as long as they are spiritually based). What Happens When We Leave? What does happen when we leave the building where our church meetings take place? Bottom line, how much racial diversity follows in our normal life relationships? Do we have friends on a social level of different races and cultures? I am hearing from quite a number of black members that we don’t. That could be the fault of those on either side of that coin. Two questions will help you figure it out. One, are you being initiated with socially by those of different races or cultures from yourself? Two, are you initiating with those of a different race or culture than yourself? I am asking for your observations about the specific contents of this blog post. What are your preferences? What are your experiences? My email address is at the top of the page. Write me and I will have a blog in the near future comprised of what you as the readers contribute. I will use no names unless I think a given input would be enhanced by doing so – and I will not do it then without first getting your permission. Further, I will copy and paste what you say into a separate document and then delete your email. I just want honest input here, so if you have strong feelings about anything I’ve written here, please respond. If you have strong feelings about anything in Parts 1 and 2 (or any other blog posts), please respond. I am consistently having discussions with those of other races and ethnicities in person, and certainly welcome them in writing. Your voice can be heard ─ so speak to me and help me and help me help others!